Lexington native and former UK outfielder Collin Cowgill was named to the All-Southern League postseason team. Current Louisville Bats outfielder Dave Sappelt was also selected to the team for his work for AA Carolina. Bats second baseman Chris Valaika and outfielder Wladimir Balentien were selected to the All-International League postseason team. First baseman Yonder Alonso, catcher Corky Miller and right-handed pitcher Carlos Fisher joined left-handed pitcher Aroldis Chapman as Bats promoted to Cincinnati with the September expansion of rosters. Jason Stella of the Bats’ media relations department recently sat down for an interview with the newest Cincinnati Red: Yonder Alonso. John Manuel of Baseball America breaks down the best prospects in the Arizona Fall League, including Lexington Catholic alum Ben Revere. The Louisville Bats used big nights from first baseman Yonder Alonso and catcher Corky Miller en route to a 6-3 win over Indianapolis. Alonso tallied three hits, including a home run, and Miller homered and drove in three runs. The Lexington Legends scored three runs in the top of the ninth inning to earn a 8-6 come-from-behind win over Augusta. The first three batters in Lexington’s lineup combined to go 6-15 with five runs scored in the game. Former UofL infielder Chris Dominguez was 2-5 with a run scored for Augusta. The Bowling Green Hot Rods scored three runs in the ninth inning but couldn’t complete the comeback in a 6-4 loss to South Bend. Left-handed pitcher Kyle Lobstein took the loss after surrendering three runs in five innings. 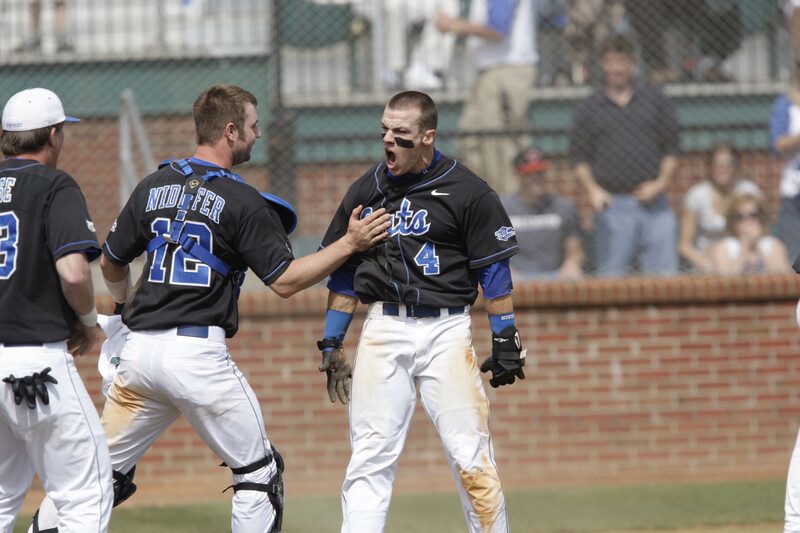 Former UK outfielder John Shelby slugged his ninth home run of the season for AA Birmingham. Former UK catcher and 2010 Astros NDFA Marcus Nidiffer was 3-4 with two runs scored for short-season Tri-City. Former NKU outfielder Jake Shaffer was 2-5 with a double, three RBI and a run scored for high A High Desert. The Louisville Bats won their 11th consecutive home game and recorded their 15th win in the last 16 games with a 8-7 victory over Norfolk Sunday. Catcher Corky Miller was 3-4 with two doubles, three RBI and one run scored. Lexington Legends closer Kirk Clark, the franchise saves record holder, blew just his sixth save of the season by surrendering two runs in the ninth inning in the Legends’ 2-1 loss to Delmarva. left-handed pitcher Luis Cruz surrendered just two hits in seven shutout innings while striking out four and walking three batters. The Bowling Green Hot Rods wasted a strong starting performance from right-handed pitcher Albert Suarez in a 5-2 loss to Fort Wayne. Suarez surrendered just one hit in four innings and struck out four batters while walking none. Former UK left-handed pitcher Chris Rusin earned his first AA victory after surrendering two runs in six innings for AA Tennessee. Rusin struck out four and walked none. Former UK catcher Sean Coughlin was 3-3 with a home run, five RBI and two runs scored for AA Mobile. In what turned out to be a big night for former Cats in Mobile, former UK outfielder Collin Cowgill slugged his 13th home run of the season for the BayBears. Former UofL first baseman and 2010 Rangers draftee Andrew Clark was 3-4 with two RBI and a run scored for short-season Spokane. Former WKU outfielder Chad Cregar slugged his 15th home run of the season for low A Greensboro and drove in three runs. Former NKU right-handed pitcher Nathan Jones fell to 8-5 on the season for high A Winston-Salem after surrendering three runs in five innings. Frankfort native and 2010 Royals draftee Cameron Conner was 3-6 with a triple, walk and run scored for the rookie-level AZL Royals. Danville native and 2010 Tigers draftee Patrick Cooper suffered his worst professional start to-date but still escaped with a no decision despite surrendering six runs in two and two-third innings for low A West Michigan. The Louisville Bats pounded out 11 hits behind recently demoted Cincinnati Reds right-handed pitcher Micah Owings en route to an 8-3 win over Gwinnet. Owings surrendered just one run on one hit in three innings, and shortstop Zack Cozart, third baseman Juan Francisco, right fielder Daniel Dorn and catcher Corky Miller each homered for Louisville. The Lexington Legends tallied seven hits but couldn’t score a run in a 3-0 loss to Savannah. Right-handed pitcher Tanner Bushue took the loss despite surrendering just two runs in six innings and striking out six batters. The Bowling Green Hot Rods pitching was no match for the Cedar Rapids offense in a 7-2 loss to the Kernels. Third baseman Julio Cedeno was 2-4 with a run scored for the Hot Rods. Former UK catcher and 2010 Astros NDFA Marcus Nidiffer slugged his eighth home run of the season, drove in three runs and scored twice for rookie-level Greeneville. Elizabethtown native Nathan Adcock earned his eighth win of the season after holding Dunedin scoreless for six innings on just two hits for high A Bradenton. Louisville native and 2010 Astros draftee Jason Chowning picked up his first professional win with three scoreless innings of relief for short-season Tri-City. Boyd County High School alum and 2010 Royals NDFA Tyler Gatrell earned his eighth save of the season for the rookie-level AZL Royals and still hasn’t surrendered an earned run in his professional career over 13 and one-third innings. 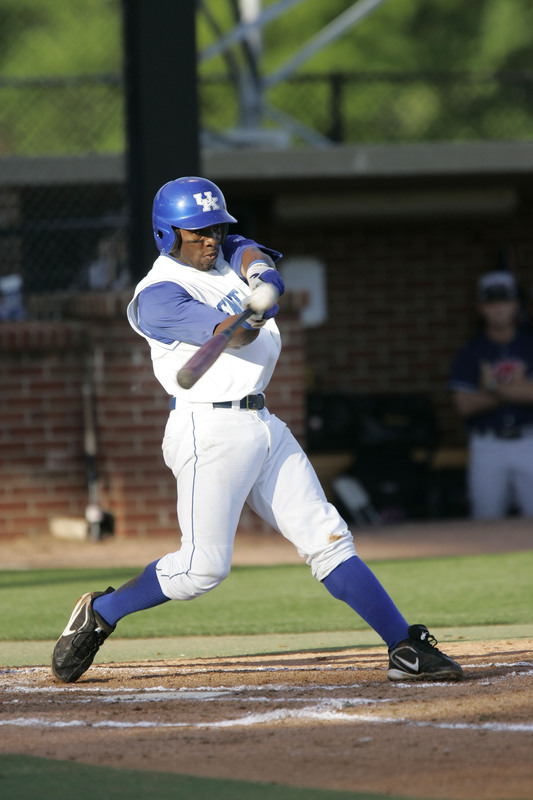 Former UK outfielder Antone DeJesus was 3-4 with a walk, run scored and one RBI for AA Springfield. Former UofL infielder Chris Dominguez was 3-4 with a double, run scored and RBI for low A Augusta. Former EKU infielder Neil Sellers was 3-4 with a double and two RBI for AAA Lehigh Valley. Ballard High School alum Jeremy Sowers earned just his second win of the season for AAA Columbus with two scoreless innings of relief Sunday. Paducah native and 2010 Rangers draftee Jonathan Roof was 2-5 with three RBI and one run scored for low A Hickory. Valaika was one of the few bright spots for the Bats’ offense during the first month of the 2010 season. The infielder has yet to homer in 2010, but lead the team in batting average, on-base percentage and runs scored in the month. Chapman has been as advertised so far in 2010 and has dominated AAA competition at times while still showing some control problems that have kept him from a big-league callup. The Cuban defector leads Bats starting pitchers in ERA, batting average against and WHIP. Bowling Green native Corey Hart hit his 12th home run of the season for the Brewers. Former Bat Edwin Encarnacion hit his ninth home run for Toronto. Former Bat Kip Wells won for Cincinnati behind former Bat Corky Miller’s first home run.